Art Jones’ installation arose from a desire to ‘activate the space’, and to engage the way that the history of the building felt so present, and so palpable to him on his first visit to the Home. The current sound and video installation was conceived to suggest a dialogue with the Andrew Freedman Home and that ‘other’ home right across the street, BronxWorks. Conducting interviews and asking both resident and workers in the neighborhood what it means to live and work in the Bronx, Jones hopes to show how those experiences can differ from across the narrow expanse of the Concourse, literally across the street, which works as a microcosm of the class/race divide to which Robert Moses’ Cross Bronx Expressway gave physical form. 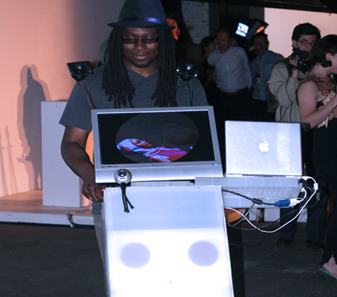 The multi-channel audio environment incorporates personal stories, street noise, music, and appropriated sound. The audio component is synchronized with the visual aspect: a motion collage projected where the interviews were conducted, the small sofa that sits right outside the library in a transient place in the home.